Explore with us some of the key trends that point toward specific futures for libraries, and engage in conversations with civic, social, and education innovators to learn more about what they think about the future, and how libraries can become an integral part of their future visions. Libraries and librarians are well-positioned to envision the future – at the intersection of information, education, technology, and community – and this dialogue will help bring our best thinking together with the exciting visions of our collaborators, allies, and partners. Sponsored with ALA’s Center for the Future of Libraries. Please also join the Library 2.0 network to be kept updated on this and future events. 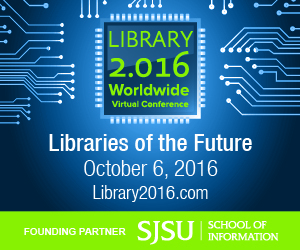 You can also use #library2016 on social media posts leading up to and during the event. We will have a limited number of slots for presenter sessions. The call for proposals is now open at http://www.library20.com/page/call-for-proposals. We encourage all who are interested in presenting to submit. The sessions will be held in Blackboard Collaborate, and can be accessed live from any personal computer and most mobile devices. Additional information will be sent with the final conference information after registration.